Wood deck removal or restoration? Which should you choose? Sometimes, it’s easy to tell. For instance, when a wood deck is badly damaged or the structure deteriorating. But, other signs are much more subtle. 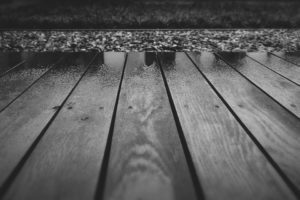 The good news is, in most instances, you can salvage a deck but if not, there are options for its removal and disposal available to you. Let’s take a quick look at the situation. Wood deck removal is a tough, tough job. It’s very labor intensive and time-consuming. You’ll need at least a couple of sets of helping hands to do it from start to finish. What’s more, you’ll need to disposal of the materials. That’s a challenge because most trash collection agencies simply do not pick up construction and remodeling debris. So, that means you’ll have to deal with it yourself. Or, you can simply call in a junk hauling service. This way, you don’t have to worry about what materials go where. Best of all, you’ll avoid the hard work and avoid wasting time carrying it from one location to the next. Plus, you don’t have to rent a truck or trailer to get it done. Repair and replace. Next, you need to inspect every inch of space. Find and replace any hardware and damaged wood board planks. This way, you’ll have new materials to last for many years to come. Use a commercial cleaner. Once you’ve replaced and repaired everything you can find, it’s time to go onto the next phase — a deep cleaning. Use a strong commercial cleaning solution. Then, rise and dry, following the manufacturer’s instructions. Stain or paint and seal to finish. To finish the refurbishment, paint or stain the deck, let dry and brush on an additional coat. Lastly, apply a sealant to enjoy the deck well into the future. If you need a deck removal done for your property, just phone 800-433-1094 or visit Junk Garbage Removal.